PLAINVILLE — A small private plane dropped from the sky Sunday and crashed into the roof of a stately Colonial home here, engulfing the house in flames as the residents ran to safety outside. All three people in the plane were killed. Federal officials said the aircraft was a Beechcraft BE36 carrying a pilot and two passengers, including a child. The identity of the victims would not be released until their relatives had been notified, officials said. “It is a miracle that the four occupants [of the house] were able to escape given the extensive damage to their home,” said State Fire Marshal Stephen D. Coan. The piston-powered plane crashed into the pale yellow, two-story home at 25 Bridle Path at about 5:45 p.m., aviation officials said. Neighbors said a couple and their two children — identified as the Rice family — lived in the house. Officials did not immediately confirm the name. Three people aboard a small private plane were killed after the plane crashed into a Plainville home. Tracy Guerrier, who lives a few houses down from the crash site, said she was sitting in her bedroom when she felt her home shake. She raced outside to see fire and smoke pouring from the other house, she said. Guerrier, 21, said her younger sister Marjorie goes to King Phillip Regional High School in nearby Wrentham with one of the children living in the Rice home. Another neighbor, Eric Tekach, who lives two houses from the engulfed home, said the neighborhood was “scared” and “shaken” after the incident but relieved the Rice family escaped safely. 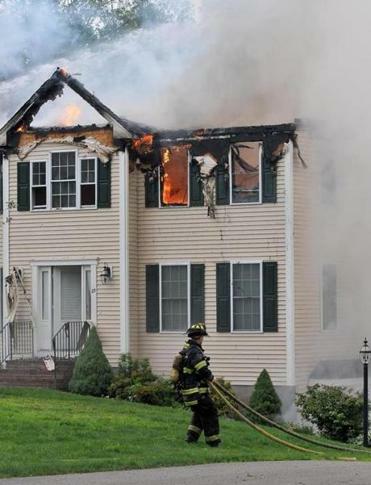 The three-alarm fire engulfed the large house on the cul-de-sac; fire departments from nearby communities in Southeastern Massachusetts were on the scene early Sunday evening, fire officials said. Eight or nine fire companies responded, Plainfield Fire Chief Justin Alexander said at the scene. The plane crashed into the back of the roof, and by midevening crews were breaking down the ravaged top floor of the structure. The fire was extinguished around 8 p.m., but smoke still wafted from the broken windows. Plainville police brought in lights for the fire department to continue working after dark. Firefighters excavated the back side of the house, climbing ladders and hoisting water hoses. Charred doors and windows were being thrown out from the second floor. The first level appeared largely undamaged despite the wreckage on the roof. At 8:30 p.m., firefighters erected a barrier to block the plane’s remains from view. Firefighters loaded boxes of goods from the burned house and brought them to a barefoot man, who officials said was the homeowner, standing at a residence across the street. Officials said neighbors heard a plane sputtering before the crash. The family ran outside when they heard the plane strike their house, Alexander said, and fire officials arrived to find them already outside. Police and emergency medical personnel were also at the scene. State Police dispatched homicide detectives and patrols, joining crime scene technicians and troopers from the fire marshal’s office at the scene, according to State Police spokesman David Procopio. Federal Aviation Administration officials said the plane departed from Lancaster Airport in south-central Pennsylvania, heading to Norwood Memorial Airport in Massachusetts, about 20 miles from the crash site in Plainville. FAA spokesman Jim Peters said the agency wasn’t immediately releasing registration information about the aircraft. National Transportation Safety Board officials will examine the scene Monday, Procopio said. The bodies of those on the plane were to be removed Sunday night by the medical examiner's office, he said. The FAA will investigate and the NTSB will determine the probable cause for the crash, officials said. The investigation is ongoing. Jennifer Smith can be reached at jennifer.smith@globe.com. Astead W. Herndon can be reached at astead.herndon@globe.com.